TRON is a blockchain-based platform that focuses on content entertainment. Most importantly, TRON users can publish, own, and store data free of charge. Since June 2018, when the network launched its main net, TRONIX (TRX) is the native token on the TRON network, currently (March 2019) in top 20 according to market size. The safest place to store TRX tokens is in one of the following TRON wallets. With some TRX tokens under your belt, you need to store them securely and safely. Therefore, you need a reliable and the best TRX wallet, either online or offline. Before you zero in on a particular wallet, you should consider that, besides choosing a good wallet, you should adopt good practices to help you keep your holdings safe and secure. The following are the best Tron wallets to hold your TRX safely for later use. In terms of security, a hardware wallet is the best. The Ledger Nano S is one of the best TRON wallets available in the market, as it’s also the most reliable. It’s small, portable, and connects to your computer’s USB port with ease. With this wallet, you can easily store your private keys securely offline. The wallet comes with rock-solid security features such as a built-in screen, a secure lockable chip, and backup recovery phrase that come in handy if the device is lost. Importantly, the Ledger Nano S wallet is a multicurrency device, able to accommodate more than 700 other digital assets. All factors considered, this wallet provides optimal security for your TRX funds. The private key that gives access to your coins remains protected with the lockable, secure chip just as the one used in passports. Besides, the fact that it accommodates more than one cryptocurrency makes it the best option for users who would like to manage multiple assets with a single hardware wallet. Another important thing to note about the Ledger wallet is that it’s not free. You have to part with money (nearly $100 USD as of November 2018) to acquire the device. However, the value is small compared to the security and safety it provides. The Altcoin.io wallet is a decentralized cryptocurrency exchange. Besides, it allows users to access its atomic swap wallet service. This wallet supports multiple cryptocurrencies, including Bitcoin, Ethereum, EOS, and many more. The truth about crypto exchanges is that they are a soft target for hackers, leading to massive security breaches and theft of funds. Traditional crypto exchanges also require users to surrender their assets to a third party, which raises the question about trust. In a decentralized exchange, there is no intermediary, so the communication is between the user and the platform. Since users are in control of their own funds, the platform is less vulnerable to hacks often common in traditional exchanges. Utilizing the atomic swap technology, the Altcoin.io is one of the decentralized exchanges where you can store your TRX holdings. Top-notch customer support: the platform focuses on customer support. It has in place a 24/7 customer support team that listens to every concern from their clients. Besides, it’s possible to reach the exchange via social media platforms such as Telegram, Twitter, and Facebook. With lots of Tron wallets to choose from, this is a helpful aspect to have! Benefits of the wallet include the absence of an intermediary, which reduces the chances of hacking. The interface is user-friendly, and customers are in control of their funds. Even so, the platform has a few downsides such as it’s new and still under construction. Aside from the Ledger Nano S, another option for a hardware wallet is Trezor. This wallet is a creation of Satoshi Labs from the Czech Republic. The hardware wallet supports more than 700 cryptocurrencies, TRX included. With it, users are able to store their private keys in a cold storage offline. Upon transaction, the device connects to the Trezor Bridge, which eventually interacts with your selected browser. In the same way as the Ledger Nano wallet, Trezor wallet requires users to provide information by using two buttons. It is simple, with a user-friendly interface. However, the wallet is available for a price, according to the version you’re purchasing. Easy, final backup of wallet: it comes with standard recovery seeds, which enable users to recover the entire wallet with a 12-word seed. 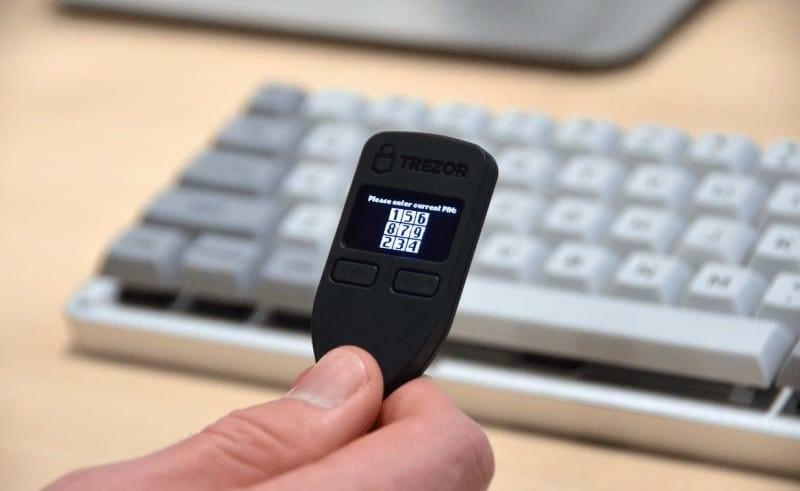 Safe storage of password: The Trezor Password Manager locks passwords individually using digital keys. 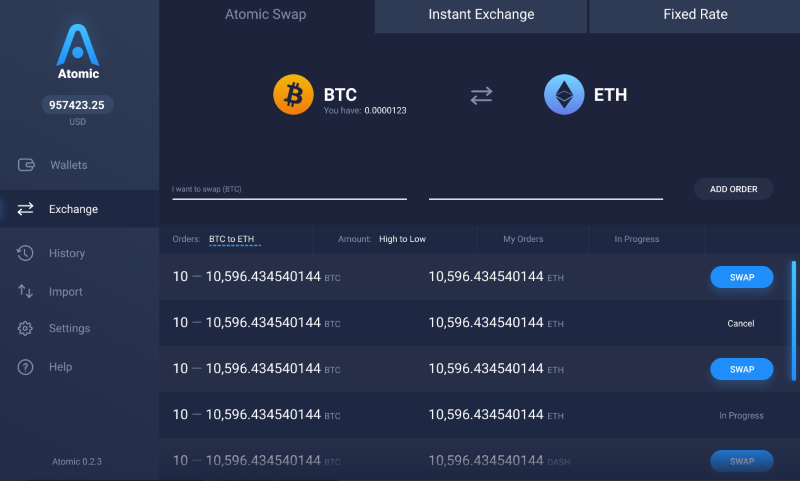 The atomic wallet enables users to buy, sell, and store more than 300 cryptocurrencies using its built-in atomic swap exchange. Major currencies supported include Bitcoin, Ethereum, XRP, Litecoin, XLM, and many others. Users are able to exchange their assets through non-custodial Atomic Swap technology, using a decentralized order book. In addition, the wallet comes with a powerful, in-demand service, which enables users to minimize the effort they use to manage their digital assets. This makes the Atomic wallet transparent and reliable. The following highlights make Atomic one of TRX’s best wallets. Atomic swap technology: the wallet uses atomic swap technology to enable its users to perform a cross-chain exchange, which helps them avoid third-party risks. Besides, it has built-in ShapeShift, Changelly, and ChangeNOW exchanges to support coins not supported by the swapping technology. Secure: the wallet users enjoy strong encryption of their private keys, as well as custody-free solutions that lead to an uncompromised level of security. In the end, users have full control over their funds. Multi-asset: the Atomic Wallet is designed to accommodate more than 300 digital assets. This makes it a convenient wallet to store your TRX holdings. Currently, it supports Bitcoin, Litecoin, Ether, XMR, TRX, and many more. They keep updating the list and eventually will include more. Crypto purchase: with the Atomic wallet, users are able to buy cryptocurrencies such as Bitcoin, Litecoin, or TRX using their bank cards. The wallet accepts major world currencies, such as USD, EUR, as well as any other local currency worldwide. Also known as TRON Android Wallet, this wallet is a preferable choice for many users due to its multifunctional feature. It comes with a practical user interface together with a built-in cold-wallet that enables users to store and secure their TRX coins. With such noble features, this one is definitely one of TRON’s best wallets. TRON Android wallet is a mobile device with full encryption by a password. The 24-word recovery seed provides an additional layer of security and enables users to recover their password. The wallet is popular because it is the most recommended wallet for Android users. Besides, the wallet also serves as a block explorer, through which users can see the latest blocks and transactions. They are able to view representative candidates, connected nodes, token distributions, and accounts. Also known as one of the main TRON wallets, TronScan is a TRX online wallet that provides easy and quick storage to TRX coins. Getting started with the wallet is easy with a straightforward sign-up process. Users are able to save a copy of their private key automatically and the wallet’s interface is easy to navigate, albeit not quite easy to view. The data regarding transactions, account balances, and others are displayed on the screen and easily accessible. Besides, users who would like to freeze their TRX coins can do so instantly and hassle-free. All the same, despite its reliable features, online wallets are vulnerable to hacks. For the TronScan wallet, you just have to keep your private keys secret. With this wallet, users are able to access their TRX coins from any device with internet connection and a browser. It might not be the most secure TRX wallet, but the interface is easy for users to navigate and store their assets. It’s always not a good idea to release a large number of coins into an online wallet, owing to their overall vulnerability. You need to start with a small amount of TRX coins and increase the amount only when you’re sure the funds are safe. Besides, it’s also advisable to adopt good online practices and keep your private key safely. Want to learn more about TRON? Read about how Tron’s transactions have passed other major coins in our in-depth article. You can also read about how Tron’s price was boosted earlier this year with the rumor of a big partnership. Interested in investing in Tron? You’ll want to start with our Tron price prediction article as well as our analyst’s read on TRX trading in our Tron Technical Analysis. The best place to buy or trade for TRX is on Binance. After, you can utilize one of the great Tron wallets listed above for safe keeping!